Stop by any participating Bass Pro Shops April 13th through 21st for their Easter Event for crafts, giveaways and a FREE 4×6 Photo with the Easter Bunny! April 15 & 16 the first 75 kids get a FREE Bunny stress toy. 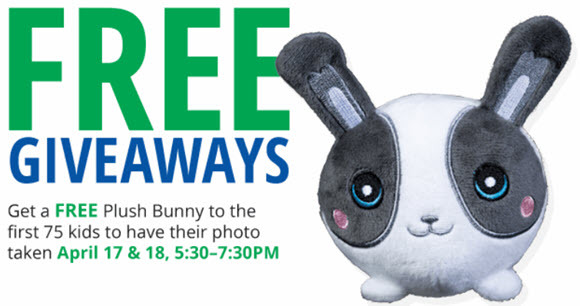 April 17 & 18 the first 75 kids get a Free Plush Bunny. Kids eat free while the bunny is in town. FREE Easter Egg Hunt on Saturday, April 20th starting at 2 pm. Crafts including a bunny wall hanging, standing wood Easter Bunny decoration and Free Easter Wreath. Some Canada and Maine locations are closed or have special hours on Good Friday and Easter. Check your local store page for info.